At least 11 people have been killed and 67 injured since 21 April during constant airstrikes and shelling in Haradh district, a district of the Hajjah Governorate, northwestern Yemen. 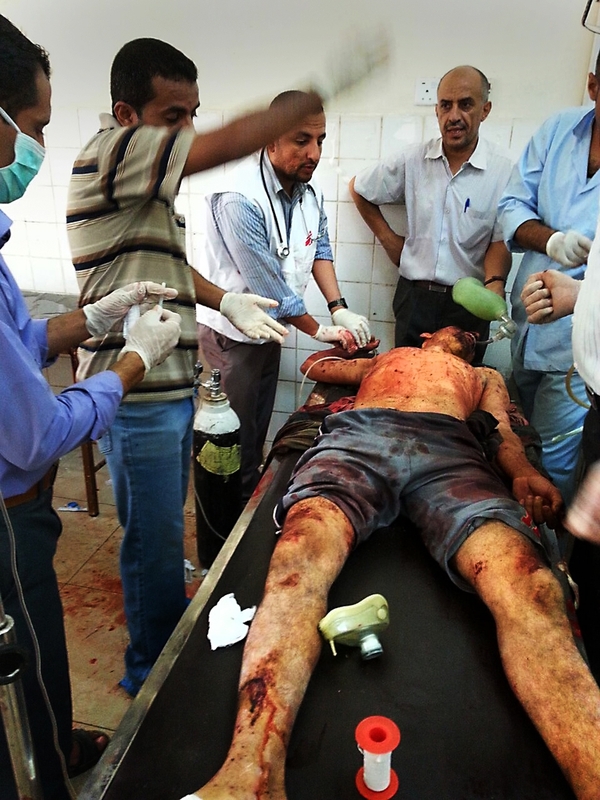 The 67 wounded were treated by Médecins Sans Frontières/ Doctors Without Borders (MSF) medical staff in Haradh public hospital, which is supported by MSF. Haradh has been left a ghost town after its population fled the violence of recent weeks. The latest attack took place on the night of Friday 24 April, when several shells hit Haradh town. Large pieces of shrapnel landed less than 30 metres from Haradh public hospital, as medical staff received the first wounded. Nine injured arrived at the hospital; two of them died despite the efforts of Ministry of Health and MSF staff. A patient of the recent airstrike of Al Mazraq Camp on March 30th. 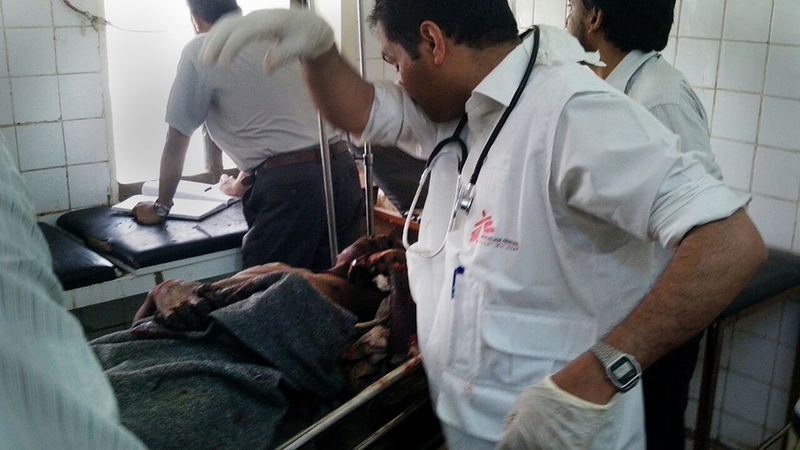 At least 34 people wounded in the attack were brought by ambulance to this MSF-supported hospital in Haradh. Since Friday night, most of Haradh town’s remaining inhabitants have abandoned their homes, heading south in cars and trucks crowded with people and goods to Abs district and Hudeidah governorate. Haradh public hospital, which serves more than 150,000 people, was left almost empty after the majority of its staff and patients fled on the morning of Saturday 25 April, fearing that the hospital would be hit. Haradh public hospital was the last of the town’s four hospitals to remain open. “The attacks on Haradh town have forced most of the population to flee, while those who have stayed behind are now cut off from healthcare,” says Teresa Sancristoval, MSF’s programme manager for Yemen. MSF had previously treated 34 wounded after an airstrike hit a camp for displaced people in Al-Mazraq, near Haradh, on 30 March. MSF has now directly treated more than 1,200 people wounded by the violence in Yemen since 19 March, at its projects in Aden, Ad-Dhale, Amran and Hajjah governorates. Since the conflict started, MSF has also donated medical supplies to hospitals in Sana’a, Aden, Saadah, and Lahj governorates.